1) Section 4 states: ”4. Open meetings. 2) Section 10 states: “10. Rules and regulations for conduct of meetings. 3) Section 10.1, Part a states: “10.1. Public participation. Section 10 permits a public agency or authority to adopt “the rules and regulations necessary for the conduct of its meetings and the maintenance of order.” The Port Authority of Allegheny County has done so with the Port Authority of Allegheny County Board Policy governing presentation by members of the public to the Board [located at Internet web address: < http://www.portauthority.org/grow/pgboardPolicy.asp >]. As with public meetings of Pittsburgh City Council, Allegheny County Council, Allegheny Regional Asset District, etc., any resident of the Port Authority Transit service area (which encompasses area beyond the boundary of the County of Allegheny) has the right, under the Pennsylvania Sunshine Act, to address the Port Authority Board at any—or every—publicly advertised meeting of the Board of Directors, provided they comply with the regulations set forth in the Board Policy. My letter of June 9 complied fully with this Board Policy. 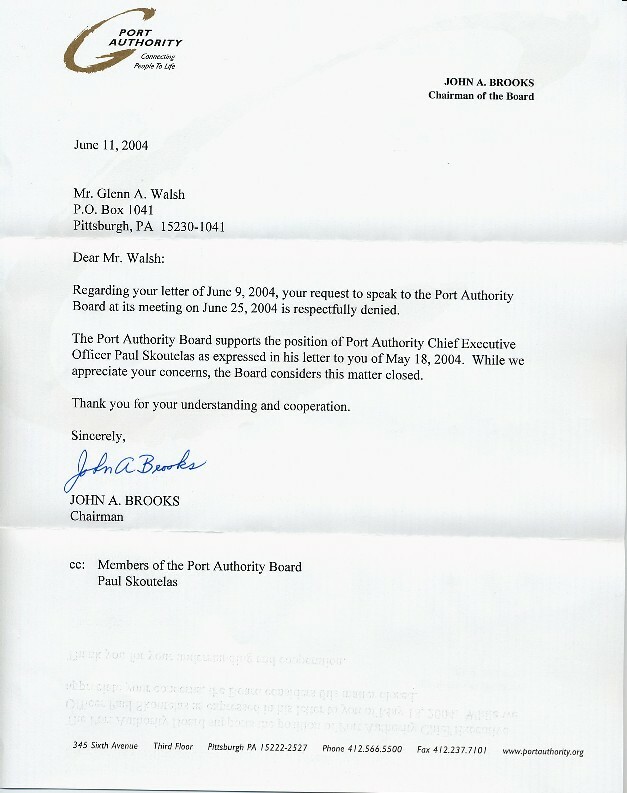 Hence, Mr. Brooks, your denial of my request to speak before the Port Authority Board on June 25 , or at any advertised public meeting, is in violation of Section 10.1 Part a of the Pennsylvania Sunshine Act. So, if your decision is not reconsidered, I have the right under the Pennsylvania Sunshine Act to verbally object to the proceedings, when the Board meeting agenda reaches the New Business section. As this objection is protected by the Pennsylvania Sunshine Act, the chairman of the meeting does not have the right to rule me out-of-order; my objection must be heard and considered by the Board. Due to these provisions of the Pennsylvania Sunshine Act, I, respectfully, ask that you reconsider your decision denying my request to address the Board on June 25.